Both of our boys battled baby eczema when they were little. They both got it after their major sicknesses. If you are unfamiliar Mica had a staph infection in his neck when he was 7 months, and Isaak had meningitis when he was 2 months. Antibiotics were pushed down them. All for good reason. They saved their little lives. I think back and man they were sick. Their white blood cell counts went through the roof, and they both had nasty fevers. Mica couldn't turn his head to eat. Isaak didn't want to eat at all. They both had that sick cry that went on and on. I waited at their bedsides, read to them and sang to them. With heavy antibiotics given to them they both developed baby eczema on their heads. Since this happened to Mica first I thought it was cradle cap. I called it "Cradle Crap". I was thinking that's what he had because I was unable to bathe him like I would if he were well. I scrubbed his little head until it bled. This is not something I was proud of. I just read that that's the only way to get rid of cradle cap. Except it wasn't cradle cap. It was baby eczema. I tried creams and oils, and nothing helped. They just made him look like a grease monkey, with a sore under the grease. It was recommended to me to by a family member to give Mica probiotics. So 8 years ago is when I first was introduced to probiotics. It took a few weeks of him taking them, and it started lightening up. Later on the same went for Isaak. Except I was experienced in the problem at hand. Sure enough probiotics cleared him up. Mica always has been my mysterious kid. 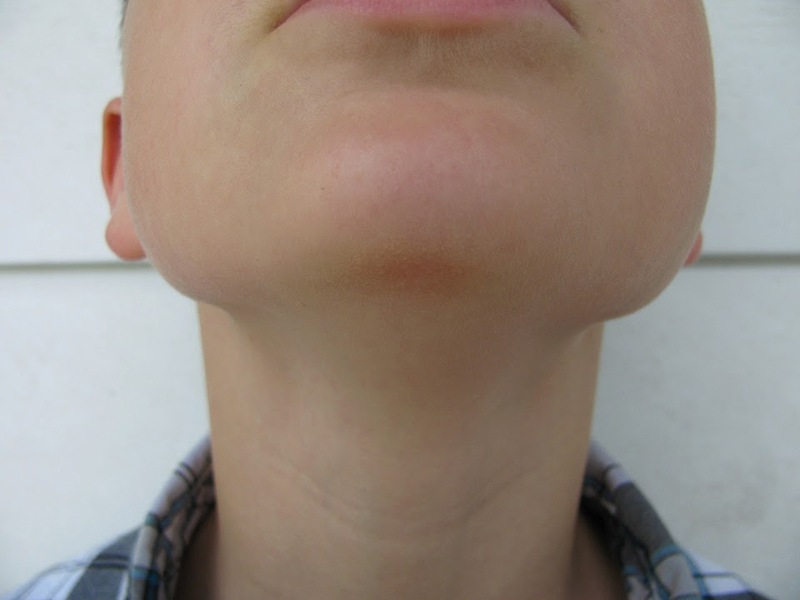 He was born with a cyst under his tongue, which made his tongue thin on one side. He had to get an MRI to see if he had a cyst in his brain. They didn't know if he'd talk, or eat right. He clearly does both just fine. He crawled funny, and when he first started walking he limped. Now he has yet another mysterious spot. The doctor has seen Mica's chin. I took him in because the spot would not go away. He told me to wait it out, and if it still had not gone away to call him. They told me to put Hydrocortisone cream on his spot. I don't know why, but I forgot about probiotics being the only thing that helped in the past. I called the doctor once again because the spot is still here. They wanted me to email pictures in. It is actually better than what it started out being. Before it was more red, and got a pimple in the middle of it twice. They (the whole office) can't figure out what's wrong with his chin. The next step is to see a dermatologist, or just wait it out longer. I'm going to stop with the Hydrocortisone Cream and continue with probiotics and make the probiotic a paste and put it on his skin as well. It worked on the boys when they were babies. The Hydrocortisone Cream is a steroid. All those creams have side effects. Do you or your kids have skin problems? Mariah has had eczema her whole life. She's been on rx creams off and on her whole life. It seems to have slowed down these past few years though. My little one has athlete's foot all the time. His feet are SUPER sweaty for some reason. He might grow out of it? ?